This year marks the 450th anniversary of the death of Michelangelo Buonarroti, one of the greatest artists, architects, and engineers Italy—indeed, the world—has ever known. The mastery and prodigiousness of his work in a number of different disciplines, including painting, sculpture, and poetry, earned him the title of “Il Divino” during his lifetime, and has been the key to his lasting influence on western art and culture. Though he was born in a small town near Arezzo and many of his most famous works are in Rome, Michelangelo spent most of his youth in Florence where he began his long career with his first apprenticeship (under Il Ghirlandaio) at fourteen. We asked our favorite Florence guide and art historian, Elvira Politi, to suggest a Michelangelo walk to celebrate the life and work of this truly Renaissance Man in the most Renaissance of cities. Begin at the beautifully simple Santo Spirito (officially the Basilica of Santa Maria del Santo Spirito), the plain facade of which belies the Renaissance splendor within. Michelangelo’s elegant wooden crucifix hangs in the sacristry of Brunelleschi’s architectural masterpiece, thought to be sculpted when the former was just 17 years old in 1493. "Santo Spirito, sagrestia, crocifisso di michelangelo 04" by sailko - Own work (my camera). Licensed under CC BY 2.5 via Wikimedia Commons. The deceptively simple yet exact rendering of the naked body of Christ explains the young artist’s gift to the convent: while taking refuge here under the prior’s care after the death of his patron Lorenzo de’ Medici, he was allowed to make anatomical studies on the corpses coming from the convent’s hospital, which formed the base for his later mastery of the human body. From Santo Spirito, cross the River and walk to the intersection of Via dei Bentaccordi and Via dell'Anguillara, in the Santa Croce quarter. Find n. 15, where a marble plaque commemorates the years in which Michelangelo lived here as a young artist during the High Renaissance, when Florence was the center of art and culture in Italy and the western world. Continue on to Via Ghibellina to visit the Museo di Casa Buonarroti. This museum, dedicated exclusively to the the life and work of Michelangelo, was founded by the artist’s great nephew (Michelangelo Buonarroti il Giovane, a notable literary and cultural figure in his own right), and is one of Florence’s most unique collections. Since 1612, the Buonarroti family and foundation have massed an important collection of works and documents attributed directly to the artist or to his contemporaries. "Michelangelo, modello per la facciata di san lorenzo, 1518 ca. 01" by sailko - Own work (my camera). Licensed under CC BY-SA 3.0 via Wikimedia Commons. Here you can view a model of the facade of the Basilica di San Lorenzo, commissioned in 1518 by Pope Leo X for the Medici’s parish church where many of the family members are buried, but never completed (though there has been talk in recent years of completing this outer facade in Carrara marble according to the designs left by the artist), and a number of beautiful sketches signed by Michelangelo and displayed in rotation. "Buonarotti-scala" di Michelangelo Buonarroti - www.akg-images.co.uk/.../ rabattidomingie.html. Con licenza Public domain tramite Wikimedia Commons. The most important pieces in the museum collection are by far Michelangelo’s two early marble reliefs: The Madonna of the Stairs and The Battle of the Centaurs. “La Madonna della Scala” was sculpted around 1491 and is considered to be Michelangelo’s first. 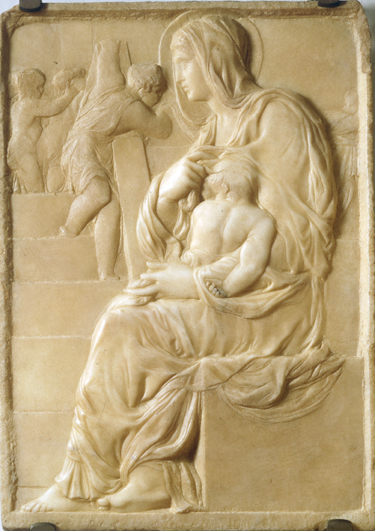 An homage to Donatello, both in iconography, including the use of stairs and rail to lend perspective, and in relief style, which features a series of parallel planes which are separated by mere millimeters, this work was a gift to the Medicis, who returned it to the Buonarroti family in 1616 for their museum collection. "Michelangelo, centauromachia, 1492 ca. 01" by sailko - Own work (my camera). Licensed under CC BY-SA 3.0 via Wikimedia Commons. The Battle of Centaurs dates from around 1492 and was the last work he completed before the death of Lorenzo de’ Medici. Important both for the its classical style and its departure from the use of parallel planes to more dynamic multidimensionality, this was the first work by the artist in which he left an unfinished border, rough with chisel marks and contrasting with the smooth finish of the figures in the foreground, which would become one of his signature techniques. Though Michelangelo died in Rome while overseeing construction on Saint Peter’s Basilica, he is interred in the Basilica of Santa Croce in Florence, as per his final request. From Casa Buonarroti, it’s a short walk to the Basilica, where you can pay your respects to Michelangelo, along with other great masters of art and culture including Galileo, Machiavelli e Rossini. "Michelangelo Tomb Santa Croce". Via Wikipedia. After this art and culture-rich walking tour, you mind may be sated but your stomach is almost certainly not. Elvira recommends a meal (best, an evening dinner with a show) at the Teatro del Sale, where the food is created with a mastery equal to that of Michelangelo by the eclectic Florentine chef Fabio Picchi.